Miami got two pieces of bad news on July 11, 2014: on the one hand, Lebron James opted to leave the Miami Heat and return to Cleveland; on the other hand, Miami will soon be under water due to rising sea levels caused by global warming. Only one of these two stories was deemed worthy of coverage by the NY Times. 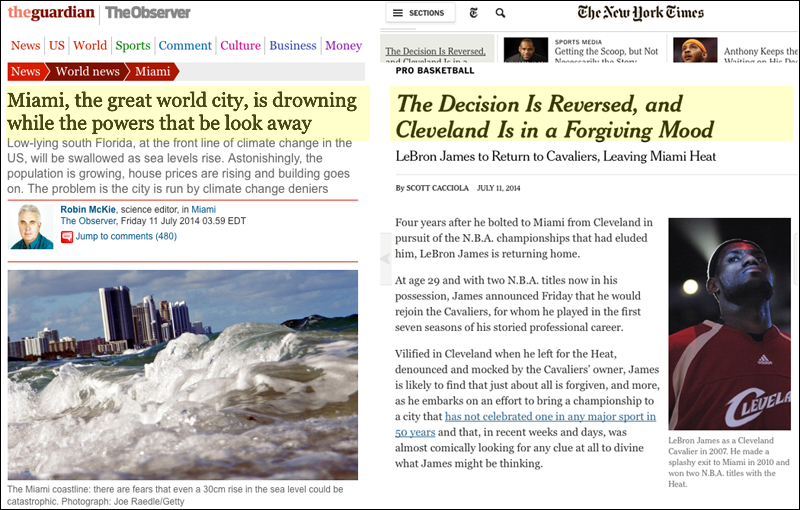 The Guardian published a story about rising sea levels and their impact on Miami (left); the NY Times worried more about the impact of losing LeBron James to Cleveland. This entry was posted in Uncategorized on July 13, 2014 by jonochshorn.